SAN FRANCISCO June 2011 Apple® today previewed iOS 5, the latest version of the world’s most advanced mobile operating system, and released a beta version to iOS Developer Program members. 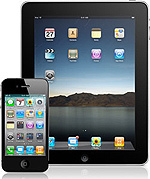 The iOS 5 beta release includes over 200 new features that will be available to iPhone®, iPad® and iPod touch® users this fall. New iOS 5 features include: Notification Center, an innovative way to easily view and manage notifications in one place without interruption; iMessage, a new messaging service that lets you easily send text messages, photos and videos between all iOS devices; and Newsstand, a new way to purchase and organize your newspaper and magazine subscriptions. With the new PC Free feature, iOS 5 users can activate and set up their iOS device right out of the box and get software updates over the air with no computer required.